What could be finer for a Spring day hike than a Ziploc bag full of homemade beef jerky goodness? There are no doubt more complicated and involved ways to make it and some of the jerky connoisseurs may frown upon this method, but it was super simple, delicious and was made without a dehydrator. 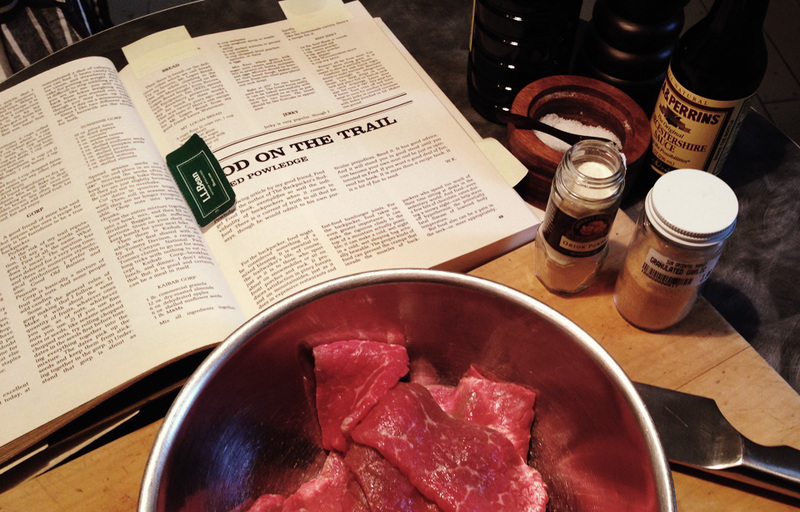 I found the recipe in "The Whole Hikers Handbook - The Definitive Sourcebook Featuring The Best Of Backpacker Magazine" published in 1979 by William Kemsley, Jr.
Jerky is very popular, though I hardly ever take it. If I do, it is not the commercially prepared type. I like the homemade variety. Here’s a recipe for it. Remove all fat from meat. Cut into ¼” slices along the grain. It is easier to slice if partially frozen. Combine dry and liquid ingredient to make marinade. Marinate meat overnight in refrigerator. Drain. Lay meat strips on over rack and place foil on bottom rack to catch drippings. Leave door ajar. Set oven at 150˚F. Dry meat for 6 hours. Turn oven off and leave meat in oven for another 6 hours. As my first foray into the world of dried meat I can claim this as a success; it was meaty and tasted of beef, not teriyaki or cracked pepper, which I liked a lot. It was a little heavy on the sodium so some fine tuning will be in order, but I'll be making it again for sure - in time for some Summer hiking perhaps. If you give it a try I'd love to hear about your results or any alternative recipes you have. Happy Spring, FINALLY! Posted on April 1, 2014 by admin and filed under Recipe and tagged 1970s backpacker magazine beef beef jerky cured meat dried meat easy homemade jerky meat recipe simple whole hikers handbook.